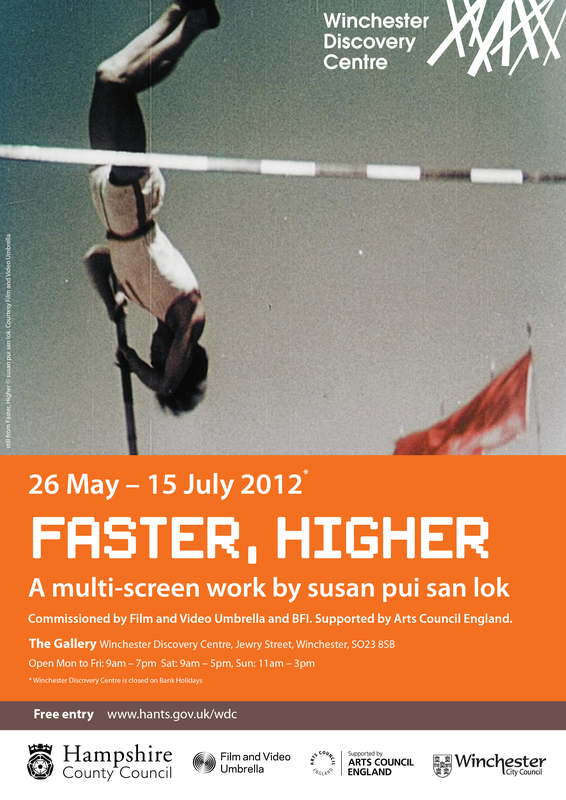 Faster, Higher (2008) is a multi-screen installation, commissioned by Film and Video Umbrella and BFI to coincide with the Beijing Olympics. The work interweaves archive material with original footage shot near the London 2012 Olympic site. Originally staged at BFI Southbank, London, it featured in Hit the Ground at the Hatton Gallery, Newcastle as part of the 2009 Great North Run Cultural Programme, accompanied by the launch of an eponymous publication. Faster, Higher was re-staged at the Gallery, Winchester Discovery Centre, to coincide with the London 2012 Olympics, and is currently at MAI (Montréal, arts interculturels), Montreal, QC (10 April – 10 May 2014). Continuing interests in notions of nostalgia, aspiration, and the archival, this five-screen work includes montages of Olympic archive material and rarely-seen Chinese documentary footage spanning the last century. In light of China’s voluntary self-exclusion from the Olympics between 1948 and 1980, and the avowed apolitical idealism of the latter as a global brand, Faster, Higher seeks to suggest commonalities in visual and cultural rhetoric, and resonances between notions of nation and sport, patriotism and physical endeavour, opening with the rituals and symbols of national ceremony and international unity: flags jostling along a succession of parades, processions punctuated by the release of doves and balloons. Colour bars and countdowns signal a different ‘universal’ language, implicating the entwined histories of the Olympics and the moving image, as well as archival points of entry. The Olympic rings are echoed through clocks, archers’ targets, lassoes, and gymnasts’ hoops, while the ascent of pole-vaulters, mountaineers, balloons and lanterns invoke the movement’s motto: citius, altius, fortius. The work explores questions of spectacle and its construction, collective identity and solitary endeavour, featuring new footage shot on location in London. Young practitioners filmed at the East London Wushu Academy allude both to individual ambition and Beijing’s campaign to assign martial arts the status of Olympic sport, while the 2012 site is rendered paradoxically visible and invisible via its blue perimeter: a literal and metaphorical screen, barrier and defence, against which dreams may be projected, protests erased, and the labour behind the spectacle concealed. 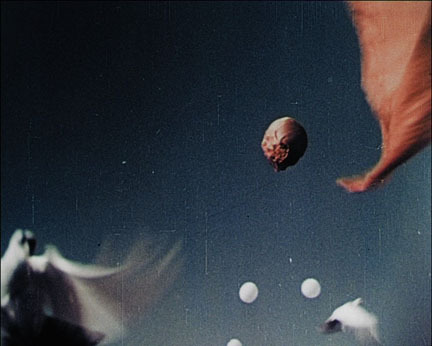 Citius, Altius (2012) is a single channel split-screen version of Faster, Higher. It was commissioned for Blue Crystal Ball: Samsung Olympic Games Media Art Collection, a collection of single-channel videos by nine contemporary artists from around the globe; the artists were Kota Ezawa, Kyungwoo Chun, Cao Fei, susan pui san lok, Kimsooja, Torsten Lauschmann, Emily Wardill, Yeundoo Jung, Hiraki Sawa and Kwungwoo Chun. Blue Crystal Ball premiered at De La Warr Pavilion and featured as part of Abandon Normal Devices (AND) Festival of new cinema, digital culture and art.